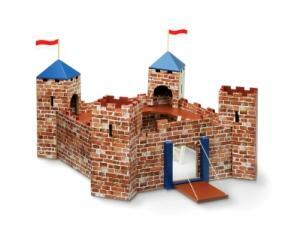 Make your son the king of his castle with this Imaginarium Medieval Castle. He will have many hours of imaginative fun with this three-and-a-half-foot castle. Get your boy's imagination going with this medieval lookalike castle. He will be able to fight from the terraces, lock up his fort from invaders by bringing up the drawbridge and closing all the doors. Have his men peer out the windows to see if the coast is clear and venture outside when all is well in the kingdom again. His imagination doesn't end with just the castle; your boy can add anything he wants to the inside as well as the outside with coordinating pieces as well as other toys he has such as Legos, Megablocks and other figurines. The possibilities are endless with this magical structure. The Imaginarium Medieval Castle comes with over 40 pieces to get your boy started on his kingdom. You will receive towers, cannons, flags, stairs and a drawbridge. Be aware that the dragons and figurines you see in the images sell separately. However, there are many different ones to choose from and you don't have to buy the ones that are especially made for the castle. You can choose just about any medieval accents you want. Working parts of the castle include opening and closing doors, a movable siege and a drawbridge. This enables your son to either be the defender of his castle or switch sides and be an invader. He could even have some friends over and they can all take sides and really get a war going. You'll be surprised by its quality and durability. It's made from CARB MDF, which is a type of wood that complies to the new standards of low formaldehyde. The outside and inside have silk-screened details, making the castle look lifelike and attractive for any room of your home. Reviewers report that assembly of this toy is not difficult and can be done in a relatively short amount of time. One reviewer said that her 10-year-old son was able to put it together with no problem. This is not a small toy, so consider where you will place this castle in your home before purchasing. The dimensions when assembled are 41 inches long by 31 inches wide by 46 inches high. Some of the reviews for this toy mention that moving it is not easy because it falls apart. While this might seem like a downfall of its construction, it's easily taken apart so that your child will be able to manipulate it to adapt to his changing imagination. While this castle is not small, there are many small parts included, so it's not suitable for children under three. Click on image to purchase from Amazon.com. 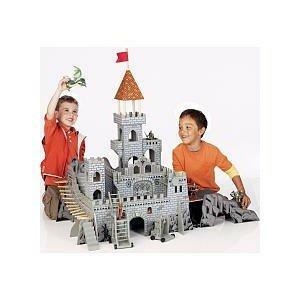 The Imaginarium Medieval Castle is an exclusive ToysRUs product. You can purchase the castle there, as well as all the accessories such as the Imaginarium Medieval Figures. Some stores carry them in stock, but you can always purchase it at ToysRUs online. You can also purchase it from Amazon.com. However, the price of it is more than ToysRUs, especially if it is in stock at your local store since you won't have to pay additional shipping. When contemplating if you should purchase this for your son, think about his excitement when he sees this for the first time. Then imagine the smiles he will have when he starts flying dragons around it and pretends that he is the defender of his castle. There are so many developmental qualities to this toy such as imaginative play and pride for something that he owns and must either conquer or defend.